It may be difficult to understand how digital, or more accurately, switching amps work, or what the differences are between the various products that are available. But it is easy to take the practical route. I just set them us side by side and did a little comparative listening. Via independent routes several “digital” amps came my way, one after another. Originally I was to review only one but at a certain moment I had 4 different ones in my living room. It then seemed only logical to review them against each other. All amps here are Class D amps, with the exception of the Trends A-10.2, which is Class T because it uses a Tripath IC. To read more about the principles behind these switching types, look here. 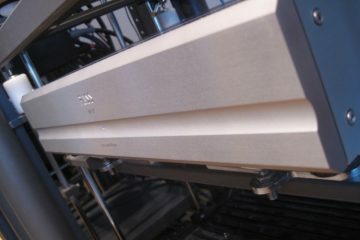 Of course I first connected the amps up in my main Reference system by replacing the Rowland amps. They would still be driven by reference equipment and would also still need to drive the huge Magnepan MG3.6R magnetostatic speakers. The Magnepans are quite difficult to drive and are pretty inefficient. 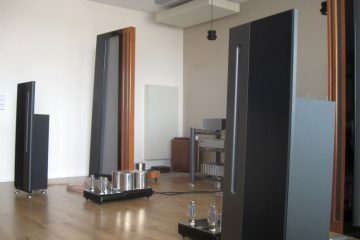 Still, all amps managed to drive them without clipping, the only limitation being bass extension and ultimate volume level. The connection with my main system was mostly for a brief impression only because I knew that their power supplies aren’t designed to drive such speakers. Nevertheless, all amps managed to drive the Magnepans with much more gusto that I had anticipated. 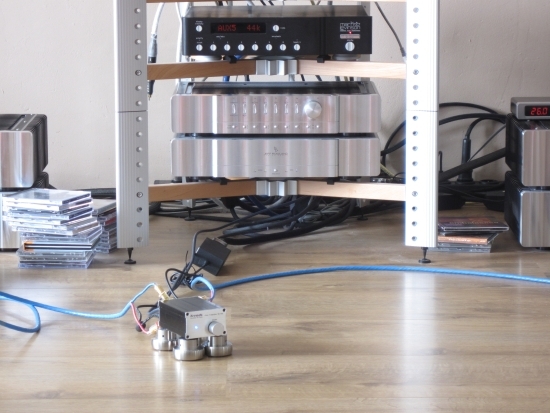 And even though the amps have limited power supplies (the Trends only outputs 15 watts! ), still they played plenty loud, and without any distortion! It was ridiculous in a sense, what these tiny amps were capable of. But you could hear that the Trends and the Wadia weren’t designed to output massive amounts of current, and frankly, I think I was torturing them a little with my speakers. 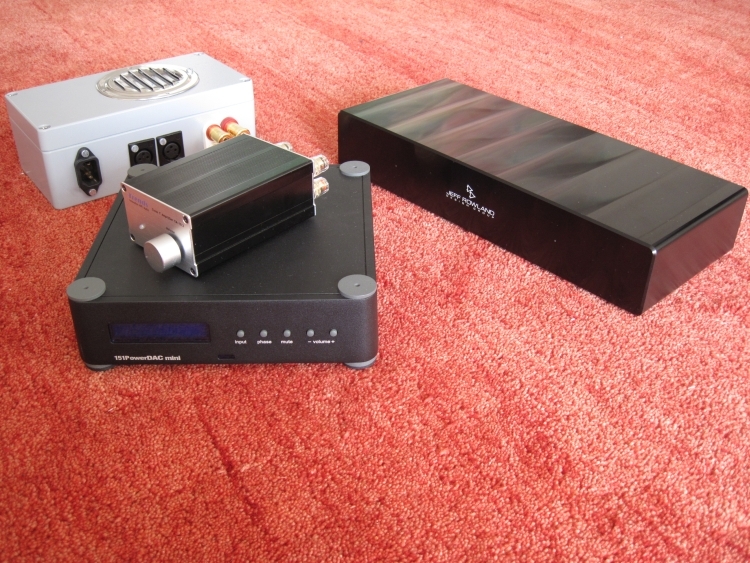 The amps can be divided into two camps: Wadia + Trends on one side and Rowland (ICE) + OEM ICE on the other. Wadia and Trends don’t use ICE and are very affordable. Wadia has a proprietary solution and Trends use a Tripath chip (hence class T instead of D). The ICE power amps differ in that they have tremendous power and grip, but they also cost a great deal more. The Rowland is around 2000 euro and the Trends is only about 200 euro. Go figure. 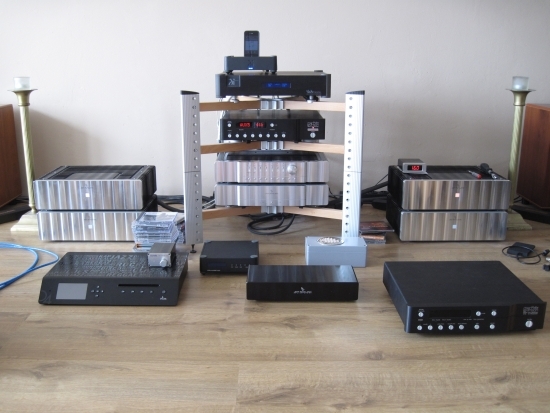 My main system and associated cabling, including preamp to all amps except the Wadia which only accepts digital. A very simple Marantz CD6000 cd player. 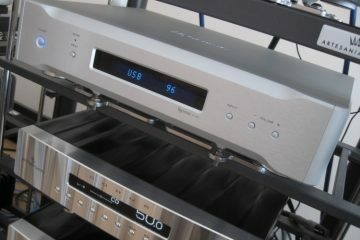 Olive 04HD music server with analog outputs to all amps except the Wadia. Cabling was initially my own reference stuff but in a later stage also highly affordable Prefer interlinks, because I know that not all equipment handles my Transparent cables well. 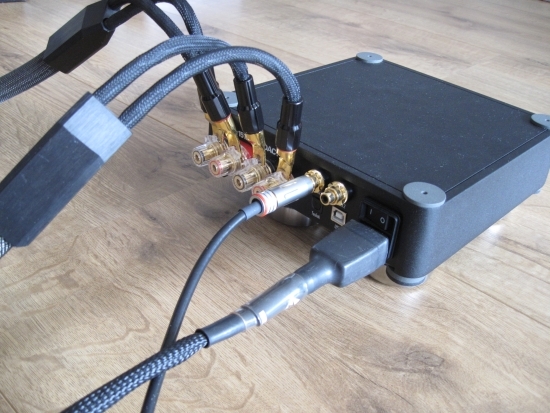 Digital cables were both my reference Wireworld Gold Starlight III+ as well as a very simple standard coaxial cable. Speaker cables to the Magnepas were my Transparent Reference XL’s into the Magnepans and Syntheses and in a later stage the much more affordable Siltech LS25MXT into both the Syntheses and the N805’s. Enough foreplay, let’s get down to it: how dit they sound? 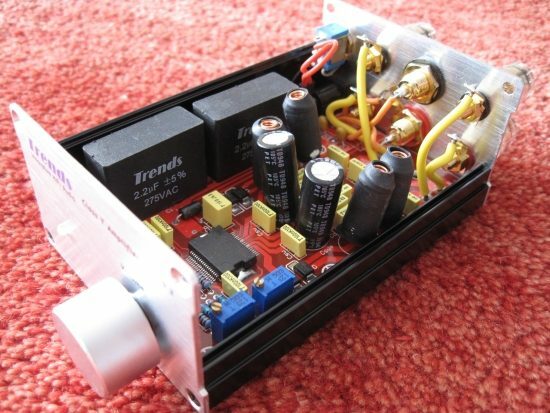 Here is a super-affordable, super-tiny integrated amplifier. 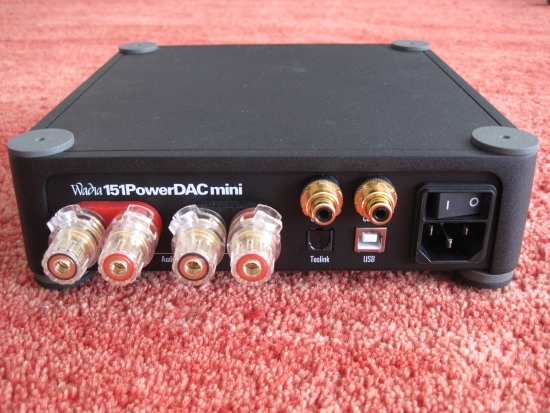 When you take it out of the box it seems ridiculous that this little unit, no larger or heavier than the company’s UD-10 USB interface, should be able to amplify much. And given its 15w rating you would not expect much either. Until you connect it up. 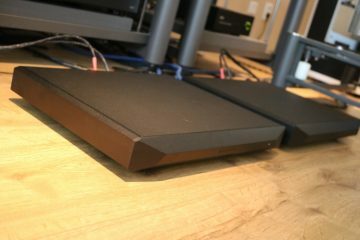 After my initial impression with the TA-10.2 driving the Magnepans I was prepared to expect more but I wasn’t prepared for what I heard when it was connected to the B&W N805’s. Driven from my usual front end, including the Coherence II preamplifier, but with simple Prefer interlinks to the TA-10.2, the sound was very lively and dynamic. It was also finely detailed and very open and airy. Focus very good and articulation througout the lower registers really was exemplary. The treble was another aspect that stood out in a good way: it was very open and agile yet never grainy or hard. While the TA-10.2 isn’t the equal of the Jeff Rowland model sixes in any way, its transparency and subtlety, articulation throughout the lower registers and its treble response still were similar to the Rowlands’ signature. Needless to say, I immediately liked the TA-10.2. It was hard to believe that this little 200 euro amp was giving me this much musical pleasure. But of course it is of no use to compare the TA-10.2 to amps costing 100 times more. Much more interesting it is to compare it to other digital amps and to make it really interesting, I also put it up against much more expensive digital amps. The TA-10.2 is an integrated amp in that it offers an analog volume control. It only has one input but could still make for a very nice, minimalistic system when combined with an ipod transport or a cd player. I tried the TA-10.2 both with the Coherence II preamp, with the TA-10.2’s volume at max and without the Coherence II, fed straight from the DAC, the Olive 04HD music server and a Marantz CD6000 cd player, using the TA-10.2’s volume control. 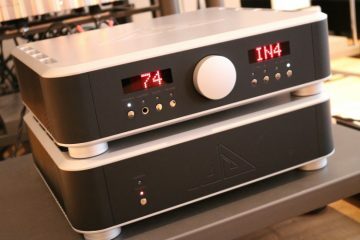 While its volume control worked surpisingly well and the sound was still very open and airy, the omission of the Coherence II preamp and its associated cables made for a loss of colour and substance, rendering the TA-10.2 a little more bland and thin in balance. It still sounded pretty good, in fact, much better I think than any 200 euro amp has a right to sound, but I prefered it with a good, musical preamp. 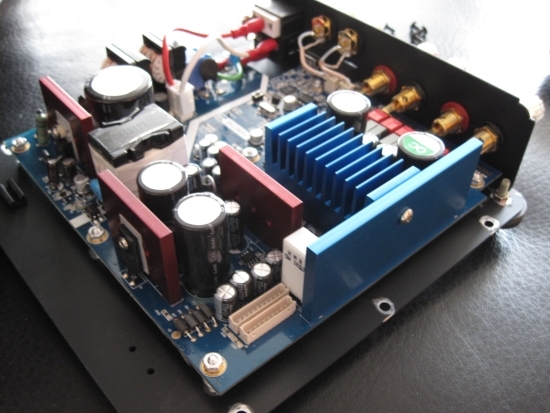 Also, the TA-10.2’s input stage was easily overloaded by the high output voltage of the Wadia 27 DAC. At 6 volts it is admittedly much higher than the norm and indeed, bringing the Wadia’s output level back to half its output worked like a charm. Needless to say, the CD6000 and the Olive didn’t cause such problems and worked very well, especially the Olive, which made a fine match with the TA-10.2. 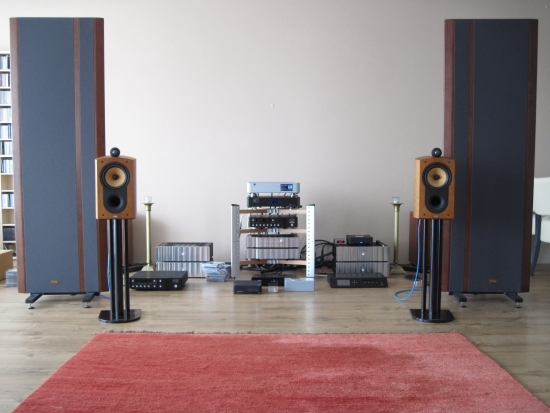 The best sound though was with the B&W N805’s, with the Wadia 27ix DAC, into the Rowland Coherence II preamp, via Transparent cables into the TA-10.2 while the latter was powered by a Harmonic Tech Pro ACII power cord. Now I realise that this company seems excessive. Even the power cable costs more than the 10.2. No matter. Still: the Trends delivered. In my book, that’s what counts. 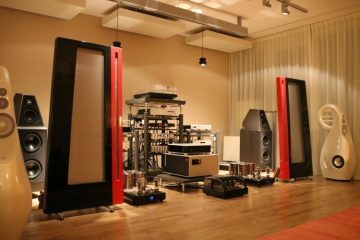 Even in the presence of highly revealing equipment, it still sounded nothing short of very fine indeed. If there was one area in which it was less than stellar, it was with respect to fullness, colour, body, harmonic ripeness. In a word: it could be a little thin. But when combined with the right ancillaries, it sounded so good that I could just stay put on the couch, listening to track after track. Considering the spoilt person that I am, I think that is saying a lot. 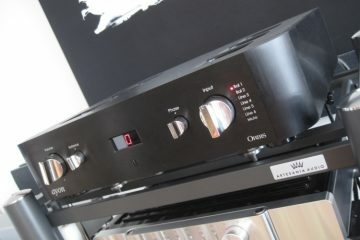 The Wadia 151 isn’t as dirt-cheap as the Trends TA-10.2 but still it offers very good value at 1200 euro. 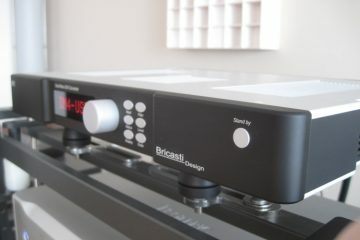 After all: it isn’t only a poweramp: it is an integrated amp with digital volume control and built-in DAC with 4 digital inputs. It has a very nice display and remote control. The 151 is especially handsome when combined with the 171i transport. Together they form a simple and classy system. 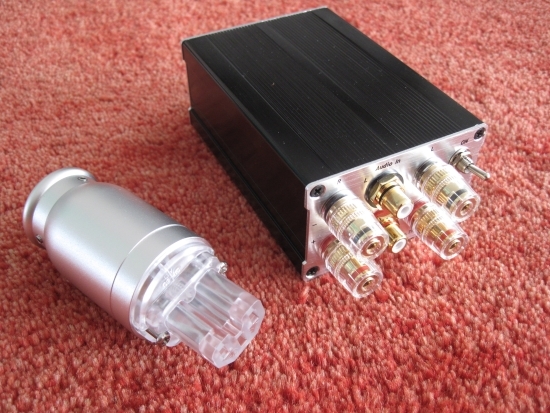 There are 2 coaxial inputs, one toslink and one usb input. The latter worked flawlessly and the dac was recognised by my Macbook’s operating system instantly. 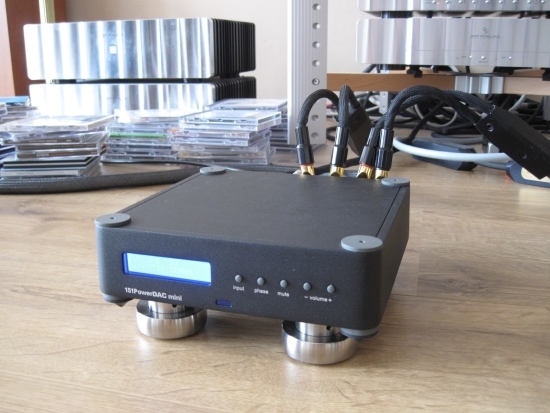 In order to make a useful and fair comparison of the Wadia (that only has digital inputs) I also used it in combination with the Olive 04HD music server, which has analog outputs as well as digital ones. 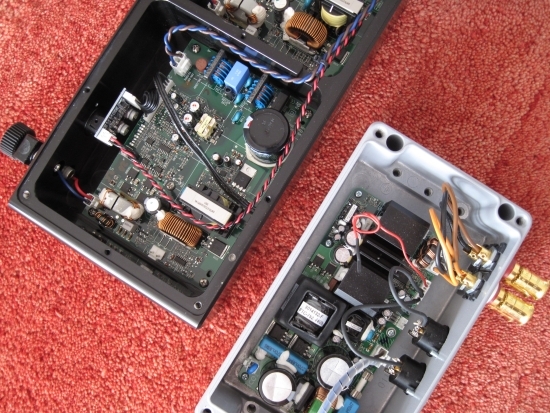 The analog output went into the other amps, the digital one into the Wadia 151. Of course I have several other reference components but I wanted to stay inline with sources in the price range that the amps are expected to work with. 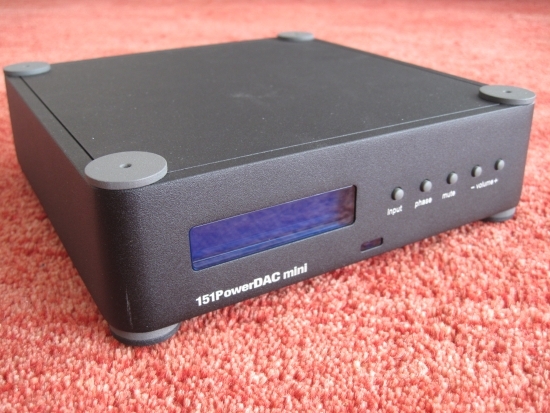 Immediately after connecting the Wadia 151 to any digital source, be it the Olive 04HD music server, the Wadia 171i transport or my usual CD or PC sources, it is obvious that the Wadia isn’t a cold, analytical sounding amp. Digital you say? Not obvious here. The sound is full, warm, smooth and even a little on the fat side. 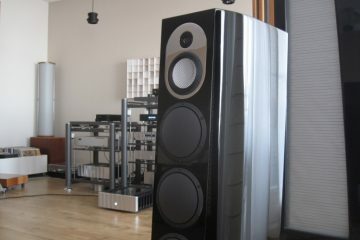 The bass is indeed very copious: thick and deep and it creates a feeling of luxury. But it also seems to slows down the sound and appears to obscures some detail. The midrange is generous: full and rich and even a little creamy. All music played sounds inviting and relaxed. The Wadia also encourages you to crank up the volume and it has plenty of reserve to do so. It isn’t until you play at levels so loud that the neighbours won’t be happy anymore, that the 151 starts to compress. Before that point, it just seems to go on, sounding louder and louder. Wadia products are always clean and uncluttered and the 151 is no exception. All connections and controls are easily accessible and the shape of the unit is just right: small without seeming too little. 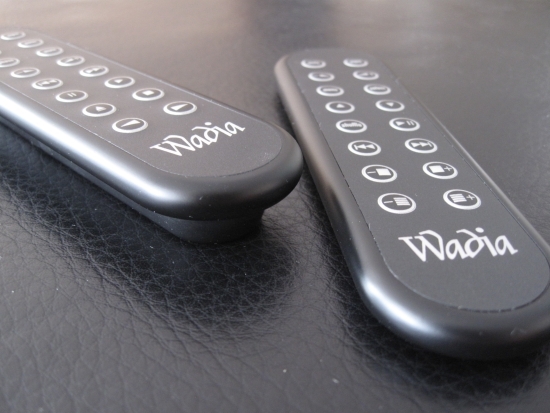 The 151 comes with a remote control that also controls Wadia transports (both CD and i-device). The left remote is for the 171i, the right one is for the 151. They have largely the same functionality but the one for the 151 is bigger, housing normal AAA batteries while the one for the 171i has watch-batteries. But after a few tracks I started to get annoyed with the treble. It isn’t easy to put into words but I’ll try to explain. The 151’s treble isn’t really shut in, even though the Trends is fresher and airier, it is open enough, compared to some other amps. But there seems to be a ceiling as if the frequency range just abruptly stops at some point. This effect may not be that obvious to others because I am admittedly very sensitive to this effect and am used to amps and speakers that do produce extreme HF. Most systems do not and compared to those, the 151 will have treble that’s inline with those systems. But what’s more: I also feel like the resolution in the treble is somehow coarse. I miss the fine detailing and subtle fluidity that all other amps present here do produce, even the Trends. To these ears, there’s something not right about the treble. I heard it on all speakers: the Magnepans, the Syntheses and the B&W’s. Again, to put this into perspective: two of my friends who stopped by to listen, weren’t aware of this effect, until I pointed it out to them. So, am I overstating it? You be the judge. But back to the 151’s overall qualities. Because its character tends toward the warm and bassy, it was best when partnered with neutral to lean sounding equipment. For example, it fared better with the 171i transport and the Olive than with the Levinson cd player. Likewise, the Siltech speaker cable worked better than the Transparent Reference XL. What the Wadia ultimately achieved when combined with the 171i transport and open sounding coaxial digital cable, I used Belden RG59, which worked better than the Wireworld Gold Starlight III+, Siltech speaker cables and B&W N805 speakers, was, apart from the treble, nothing short of amazing. There was huge bass, a smooth and inviting midrange and a big soundstage. 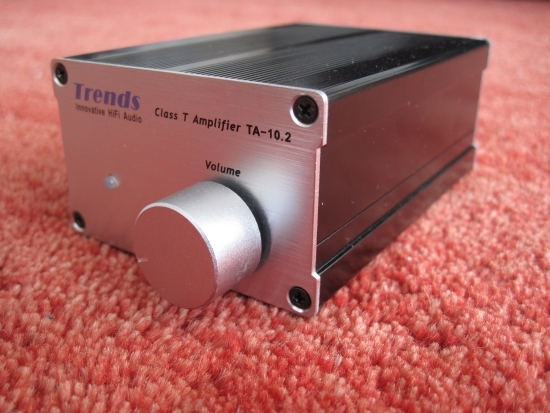 Compared to the Trends TA10.2, the Wadia had a much warmer sound with more colour, and had more power (although its laidback character made the Trends sound more forward) but the Trends had better apparent resolution and articulated better, especially through the lower frequencies. And the Trends had airier, more refined treble. So, even though the Trends lacked some colour and bass fullness, I preferred it to the Wadia. 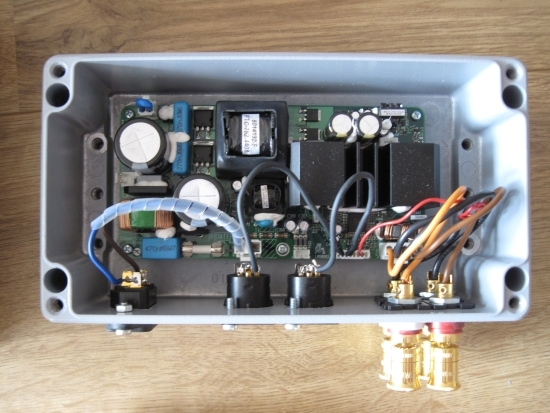 Here’s an OEM ICE power module in a home made enclosure. 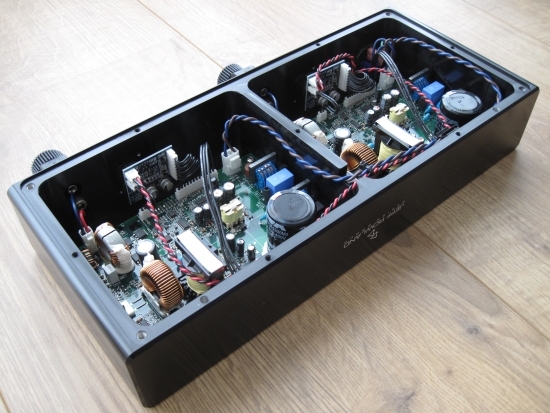 Inside is a latest generation 125ASX2 125 watt, stereo module with integrated power supply, much like the ones used in the Jeff Rowland model 102 and 201 (200ASC and 250ASP respectively) and actually the exact same as in the Bel Canto S500. 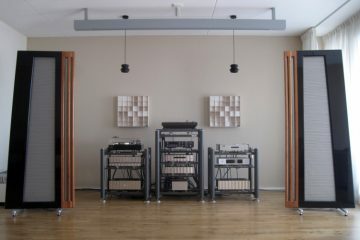 The ones in the Rowlands are of an older generation though and the ones in the 201’s are intended for high end audio while the one inside the home made enclosure as well as the one in the 102 are made for pro-audio applications. There’s a price difference too. 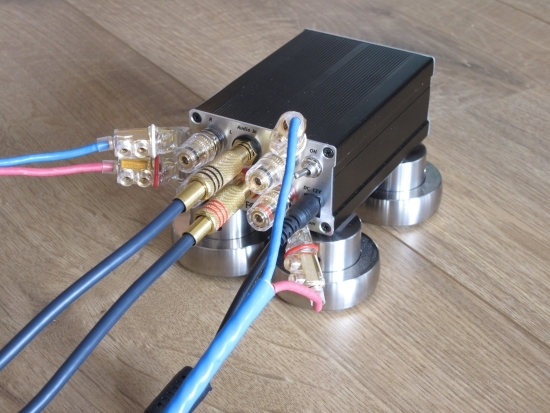 Of course it was very interesting to see how this module would perform against the Rowland 102 but before I get to that, first I will explain how it compares to the other amplifiers in this group. The enclosure is outfitted with Furutech IEC inlet, Gold-plated Neutrik XLR inlets and WBT gold plated pure copper speaker terminals. The vertilation roster at the top looks a little out of place but the owner hadn’t yet incorporated the final solution he had thought up for this. The amp does get warm in use, hence the ventilation. Jeff Rowland have solved this differently: via convection. 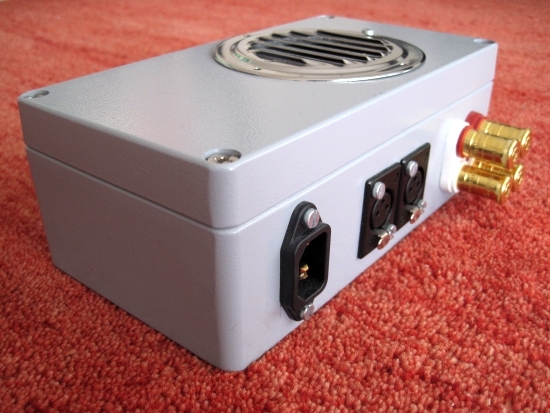 The entire enclosure there functions as a heat sink. You might wander what in heaven’s name can get hot in a switching amp: it’s the output coils. The ones that smooth the trapezium-like switched, chopped signal, and make it into a semi-continuous wave. The speaker cone’s inherent analog motion does the rest. 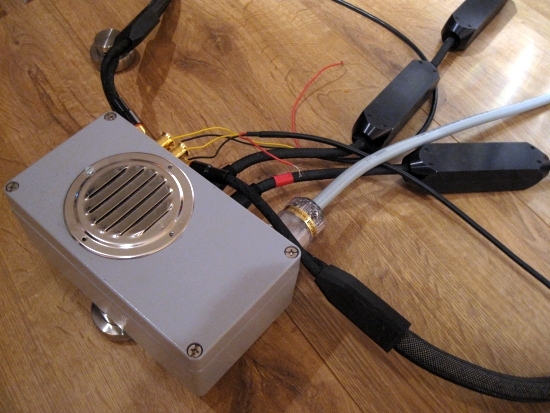 The small red and yellow wires are for the subwoofers, but this was only used in the initial stage of testing with the Magenpans. The OEM module has a strange sound signature. On the one hand it is extremely refined and transparent; on the other hand it sounds closed in, too smooth, too warm and as though it is lacking resolution. But it is in fact very finely detailed. It is just that it sounds very warm. The effect is almost like listening to an amplifier in an unfurnished room with hard floors, compared to the same amp in a room with lots of drapery and carpeting. There’s no detail lost in the process but the result can be a bit too camouflaged. But the module has oodles of power and when you crank up the volume you can really scare yourself with the sheer power present. The bass is warm but much tighter than the Wadia’s and also better articulated. Overall the module is also more transparent than the Wadia but in spite of all its transparency and refinement, it also sounded somehow cleaner, colder and overall more boring than the Wadia which displayed much more charm. Technically very flawless and with very good bass articulation and extension, state of the art treble, which was at once fluid, highly resolved and airy, still I found the module to sound unconvincing in a musical sense. The Trends on the other hand may be colder and leaner but it is much more engaging and gets your feet tapping. Finally, the piece of resistance. The 102 was generously shipped over to me by an enthusiastic French reader of this site, who, upon going on a long honeymoon, offered me to review his amp. There are still nice people in the world! I was expecting much from the 102 because I have had 201’s in the past, and they fared pretty well, even compared to my model 10 at the time. 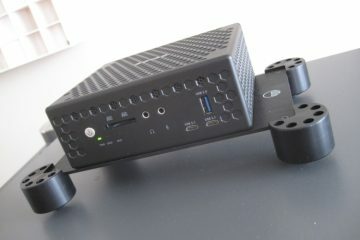 But given what I heard in the current review with the OEM module, my enthusiasm was somewhat tempered. No need. Upon connecting it, even with a cold start, back was that familiar Rowland sound: utter transparency, tight, articulate yet powerful bass, a super clean yet human sounding midrange and treble that is almost in line with the treble of my long standing references, the Rowland model sixes. It’s weird though. I say “Rowland sound”, yet there’s no real Rowland components inside. Yet it sounds like modern Rowlands. Don’t ask me how that is possible. The only explanation I can come up with is that modern Rowlands already sound very neutral and refined and the B&O Ice power modules apparently strive for the same sound. The analogue audio signal input interface is intended for balanced signal routing for best performance. However, a single-ended audio input interface can be configured by shorting the negative signal input to ground. It’s difficult to draw an overall conclusion when all amps present some unique strong points. 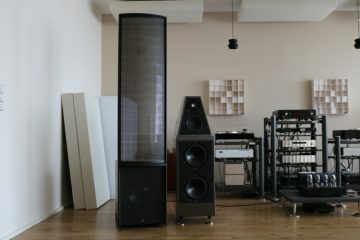 I can say that the Rowland 102 sounds best, but it also costs most (2000 euro) and is pretty limited compared to the Wadia. The 151 is very compact and very versatile and offers the complete opposite of what you’d think digital amplification sounds like. Then there’s the Trends TA-10.2. 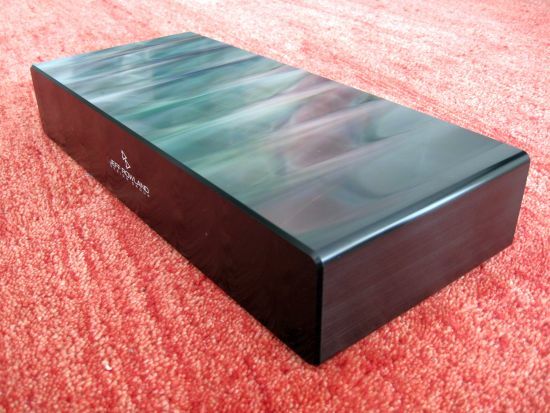 That amp simply offers ridiculous quality for only 200 euro. I can’t in all decency proclaim it the overall winner, but it was easily the one that surprised me most. A friend immediately ordered one after hearing it. And with its price being more or less in line with a decent set of WBT speaker terminals alone, this doesn’t need hard thought. The OEM ICE module disappointed. Apparently it isn’t as easy as chucking it into an enclosure and be done. Apparently there;s more to amplifier building than just assembling components. 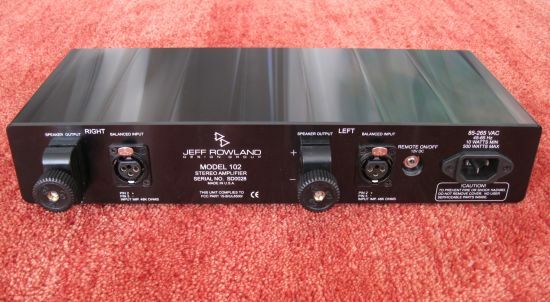 I’d say that the Rowland 102 is worth its asking price even though it costs most of all amps in this group. I just wish to point out that all amps have been compared not only on equal ground initially but in a later stage also optimised for their individual characters. That means warm cables for lean sounding components and fast and open cables for warm sounding components. My observations are based upon these optimal circumstances. Vielleicht ist der Sound des ICE 125-moduls nur deshalb so “merkwürdig”, weil die Anschlüsse symmetrisch angeschlossen sind, das Modul selbst aber nicht symmetrisch verarbeitet? Fair point, but we were really only using one phase of the XLR cable for the module without the addition of a transformer, same as would happen when you use a XLR to cinch adapter. From experience I know that this should sound more “direct” and less “filtered” than when using a transformer as what happens in the Rowland 102, even if the latter does use both signal phases of a connected XLR cable. What actually happened here is that the module is an older model than the one used in the Rowland 102 which might explain in large part the noted differences. Nachtrag: Ich stimme grundsätzlich der Bewertung im Test zu! Habe vor Kurzem selbst das Modul gehört……..
Mein Eindruck: sehr gute Feindynamik. Aber mangelnde Auflösung. I checked resources on the net (a German DIY forum, USA forums…) and JR Model 102 implementation is completely balanced from input to output. Also JR allegedly confirmed it.is balanced. The two input boards in 102 provide the balanced signal to the 200ASC and significantly enhance the sound (although i think the boards are more for impedance-matching, since the signal on the input is already balanced.). Hi Marek, I checked the ASC200 manual and you are right: the module is capable of using balanced audio. I’ve now added this to the article.